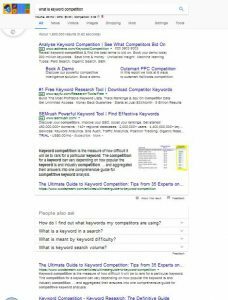 You don’t have to use this technique, but if you want to find out what is keyword competition then you better read this article. This way you can find out whether you have a chance of ranking on page one or not. You have searched for a time and finally you have found what seems like the holy grail. A keyword (a phrase people search for in search engines) with thousands of searches and very low competition, when I say low I mean 4 sites! So you start getting ideas around that topic together. You write an article of over 3k words. You add relevant images and add the alt text with keywords. Feeling smug, you click publish. You go to google tools, webmaster, and fetch the article. You wait half an hour, just to be on the safe side. And you type your keyword into google, pressing enter you smile as you expect your article to appear before your eyes. But your smugness turns to confusion, you are not above the fold. Now a crease appears on your brow as you scroll down. you start to really look at the sites on the pages, uh oh. Authority sites- even on page 4.
you go back to page 1 and look at the sites. Yep every one an authority site! Arghh…. So stepping back what should you have done? To me every keyword you try to rank for, you should be trying to get onto page 1 of google at least. Outside this there will be very little organic traffic, even page one below the fold it is unlikely to get you many organic search visitors. So how do you get to this stage? Using your keyword tool of choice, hopefully you have one which has the competition criteria. If not – no worries this technique will still work, as all you are interested in is what is on page one of Google. The competition criteria only means something if you are interested in how many sites have your exact keyword phrase – keyword difficulty definition. You have been looking for low competition keywords. With KC<30, Long Tail Pro metric, similar to Jaxxy’s QSR ( quoted search results (note)). And monthly searches above 50. Scan down the list of keywords returned and select on that looks promising, on a topic related to your niche and one you can create an article about. Click on the keyword in Long Tail Pro shows you page 1 of google. Doing this in jaaxy is a little different – you need to copy the keyword and enter it into the search box of the search results tab and then you see page 1 results. Now look down the sites listed. Do you see all video sites? Yes, leave it alone, unless you are producing a video you will not rank for this on page 1. Do you see high domain authority sites in all places, again no chance of out ranking these. However if you see a mix of authority and niche sites, check out the niche sites in a new tab and see what the article looks like. Does it look in depth? Is is really on topic or associated information? What you sometimes find is that Google returns documents, either pdfs or docx’s. With this, Google is struggling to find on topic relevant web pages, so you have a good chance of ranking. So once you have checked out page one of google then you have more likelihood of knowing whether you will be able to rank for that keyword. Finding other blogs, even older ons on there means that you have a chance. Now all you have to do is to produce higher, more relevant content than those blogs already there and you can rank above them. Note: to manually find the number of sites ranking for your keyword – Jaaxy’s QSR, then you can do the following. Enter the keyword surrounded by “ “ into Google. The number of results will indicate the number of sites with the exact match. Enter the keyword into Google with the intitle:keyword OR intext:keyword – this returns sites with the keyword in either the title or the text of the article. Taking note of the sites returned may give you some inspiration for future blog posts or guest post opportunities. Never think of other sites as competitors but opportunities – to learn and help you with your blog. Keep looking for keywords, wherever you are. Keep testing areas, you may come across one or two that will significantly help your blog rise from the noise of all of the others and start you on your way to being an authority blog, where everyone knows the name of your blog and refers to it. 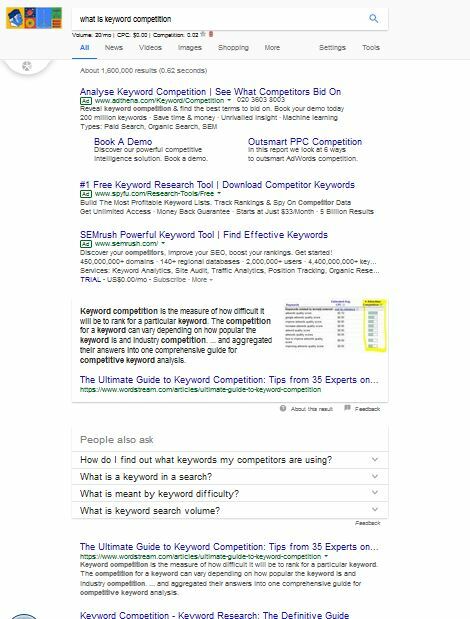 So now you know what is keyword competition and how to analyse other sites, you have a better chance of getting page one ranking than others who just use keyword research.